Simply: Wow! Dryspell #1 can be described as many things, but that one word sums up this inaugral issue in a simple elegance that is only matched by the narrative of this book. Action Lab and its imprint, Danger Zone, have delivered one of the best first issues I have read in nearly a decade. I know I usually gush over Action Lab books, but this company just keeps delivering blockbuster after blockbuster. Sometimes I feel like Action Lab is one of the few comic companies left that actually care about the comic reader, and this issue is a perfect example of their love for the comic fandom. Enter Tom. Tom is your average nine to five guy. He has a good job, a nice girlfriend and a somewhat obnoxious office best friend. Much like most people, he is floating through life, just another face in the crowd. But, he has a secret. He actually is a former super villain (or at least we think he’s a villain), who could only “perform” while under the influence of drugs. Suddenly, a human resources worker in the same company of Tom confronts him and reveals that he knows who Tom really is. This quickly spirals into Tom being drugged by the same HR representative. Once drugged Tom goes on a party binge, but is eventually subdued by a super powered individual who informs him that everyone knows about “Stacy”, his girlfriend, ending the story on an ominous note. Drugs and super powers are two topics that very rarely crossover in such an overt manner. Dryspell does it with very little reverence, and it is just so much fun. Tom is such a likable guy. He is the recovering drug addict that you want to root for, but due to his relapse in this issue, you just know that he is going to become that same bad person he was before, much like a real life relapse. This allegory to real life drug addiction is one of the subtle threads introduced in this issue that makes it so compelling. Not many books reach a level where the narrative feels completely natural but Dryspell does with ease. Comics are infamous for cheesy conversations, but this book avoids this trope easily. Every line and panel develops naturally, leading to a reading experience that feels much shorter than it actually is. Ken Kerkeler’s vision is not just a well written story. Much like Kerkeler’s writing, his art takes this book to the next level. Maybe due to the writer and the artist being the same person, this book carries a level of cohesion rarely seen in a comic. The art is superb, and changes with Tom’s mood, much like the dialogue. Seeing a book that epitomizes the comic medium’s ability to fuse word and art is amazing to behold. This is literally nothing bad to say about this book. Yes, I could nitpick and find something wrong with it, but why would I want to do that to something that is so enjoyable. 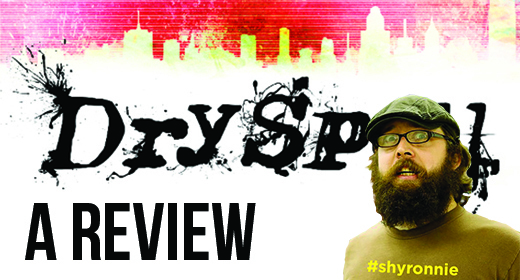 Action Lab has been climbing up in the ranks of comic book publishers for some time now, and Dryspell looks to help continue their upward trend. I give it an easy five out of five stars. Go buy this now!